Afzal Din with his unusual catch from the Nene. Is it a sea trout or a salmon? A spot of predator fishing for Afzal Din produced a very unusual catch on Sunday morning. Originally Afzal intended to fish Ramsey St Mary’s, a well known area for pike, but his plan came to an abrupt end when he pulled up to discover the venue frozen over. Prizewinners at the Yaxley AC Fur and Feather match. Breaking the ice is not too much of a problem if you are going to fish the pole for silvers but it’s out of the question for pike anglers. So it was back to the car and off to the River Nene where he opted for Orton Locks - a venue well known for pike action even when it’s frosty. Afzal cast his brand new lure around the lock basin a few times, almost going through the motions as he knew full well it could be difficult to tempt a predator in the cold clear water. Then out of the blue he had an indication followed by a solid take and within a few minutes the fish was in the net. Peterborough Conservative Club Casters recently held their annual presentations. Trophy winners pictured from the left are, Terry Tribe - winner of the Terry Uff Touring Trophy and the Biggest Fish Caught trophy (13lbs 1oz); Bob Walker - Top Total Weight of the Season trophy (353lbs) and Division One winner; Ian Bradshaw - Division One runner-up; Mark Parnell - Division Two winner; and Bill Ringer - Division Two runner-up. However, it wasn’t a pike he’d caught nor was it a zander, big perch or a chub. It was what looked to be a trout. On closer inspection it looked more like a sea trout or possibly even a salmon! The pictures were taken and the fish was returned safely to fight another day. The big question now is what was it? My money is on a sea trout, but others think it really is a salmon. Afzal sent the photo off to the Environment Agency to determine what it is but as yet he has not heard back. Whatever it turns out to be a cold winter’s day when nothing special was expected made one city angler a very happy man. Once again the winter weather wreaked havoc with the match scene right across eastern England. Several popular waters were frozen over including Decoy Lakes. Thankfully the Old Nene at March never lets us down even in the worst of conditions. Sunday’s huge Christmas special attracted anglers from all over the country eager to get on some of the best pegs anywhere for roach right now. And it was amazing to hear of so many big nets of fish topped by Dave Petch with a fine 32lb 13oz catch taken on breadpunch from the Wigstone Bridge section. Second was Steve Clarke fishing pinkie over groundbait for 22lb 14oz, then came locals Rob Wright with 22lb 8oz, Alex Bates on 22lb 7oz and John Taylor on 21lb 10oz. The Old Nene at Ramsey St Mary’s is another venue in great form and would rival the March section if only there were lots more pegs. The Ramsey AS controlled water is a favourite venue for the club at this time of year and even with two matches on it in quick succession it fished well. In the Wednesday match Harry Young took the honours with 9lb 6oz of roach, some taken on pinkie followed up by some better samples late on in the match taken on tares. All the anglers fishing the Sunday match had to spend time breaking ice in the morning before the match could start, but it was well worth the effort as some fine weights were taken. Out in front with 14lb 6oz was city rod Dave Norville, who caught a few small fish early in the match before switching to hempseed. Second was Harry Young with 10lb 14oz taken on maggot and tares. Third with 10lb 7oz was Keith Rayment and fourth Paul Kilby on 10lb 6oz. There were far more prizes up for grabs than fish caught in the Yaxley, Farcet, Holme and District AC Fur and Feather match on the Bower at Whittlesey. Steve Cox got first pick of the prizes with 2lb 14oz of roach on breadpunch. The weights then dropped drastically with Lionel Whaley second with just two fish for 5oz and Mike Mohan third with 4oz, also two fish. It was never going to be easy in the Decoy Over 55s match fished in windy conditions on the Elm and Cedar. Top man on Elm was Roy Whincup, who had some shelter on corner peg 12 and managed two small carp, two F1s and some roach on pole and maggot for 13lb 8oz. Denis Sambridge made the most of consistent peg three on Cedar to win the pool with three decent carp on feeder and pinkie for 17lb 8oz. Runner-up on Elm was Keith Rayment from peg seven with 3lb 14oz and second on Cedar was Chris Saunders with 14lb 2oz. Over at Float Fish Farm Fishery, the Saturday Christmas Open was on the Wagtail Pool was won by Shaun Waterfall with a modest 5lb from peg seven. Tony Hudson came second with 3lb 14oz. Round three of the Mainline Match Teams of Three Winter League at Rookery Waters was fished on three pools. On Jay Lake, Dennis Page on peg nine took the honours with 20lb 5oz followed by Jamie MacGuire with 7lb 5oz. Over on the Magpie Pool, Neil Smith on peg 34 finished top with 28lb 14oz just ahead of Bob Coulson with 27lb 1oz from peg 36. 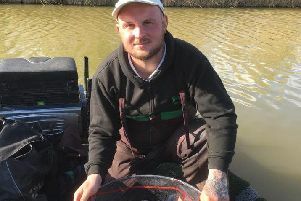 On the Raven Pool, it was Darren Ogden leading the way with 81lb 5 oz. Richard Bond (56lb 8oz) was runner-up. Tydd Gote AC’s midweek match on the North Level was won by the impressive John Taylor on peg seven with 12lb 12oz. Runner-up was Neil Adcock (9lb 14oz) followed by Archie Greenwood (9lb 7oz).